It’s been a rough week for the fast-food industry. First Fast Food Nation author and McDonald’s detractor Eric Schlosser appears on the Today Show to promote his kids book, Chew on This, for hungry pre-teens who might be considering upgrading to the double quarter pounder with cheese. Then, a cashier at Checker’s Drive-In is accused of hurling boiling grease at a rude customer in Philadelphia. (We hope the client executives are less draconian, Amalgamated.) And yesterday, a customer at a Rally’s Hamburgers restaurant in Northern Indiana said a razor blade in her fish sandwich cut her throat. 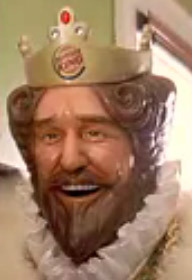 Of course, all this is a moot point at Burger King, where his majesty long ago abandoned the family market for the only solid fast-food customers—stupid young guys who are unconcerned with both the long-term effects of obesity and heart disease and the short-term dangers of the occasional foreign object.